Painting hardwood floors instead of installing carpet or stripping and refinishing them can be a stylish and inexpensive choice if you want to update your flooring on a budget. Doing a great job doesn't involve special talent or expensive tools. The secret to success with floor painting is in taking the time to prepare the floor well. The steps you'll take for different finishes require different treatments. For the best results, always remove all the furniture from the room. This will save you from having to risk scratching your work as you move the furniture from place to place. Painted Floors - If your floor is already painted, you may be in luck. You can easily remove paint from hardwood floors yourself; if they are in bad condition, you may need to hire a professional. Bare Wood - If you're working with a bare wood floor, sand it smooth using progressively finer grit sandpaper. Once it's smooth, clean it thoroughly. Be sure that you've removed all of the sanding dust before you add the new paint. It's a good idea to clear any wall décor or window coverings before you paint to avoid dust from hanging objects sifting onto the wet paint. Once the floor has been sanded and cleaned, add a coat of primer, or use self-priming floor paint. Varnished Floors - A varnished floor has a slick surface that will have to be sanded, cleaned, and primed. Once the floor has been repaired, primed, and cleaned, place painter's tape around the baseboards at the floor line. Press the tape firmly in place to make a good seal. Now you're ready to move on to the next step. Of the entire process, the prep requires the most work. Paint will add color and style to your room and solve the problem of an outdated and worn floor, but it won't camouflage everything. The more time and effort you take now to create a smooth, clean floor, the better the end result will be. Choosing the right supplies is important, so take a moment to find a quality brushes, rollers and paint. Using the right supplies for the job saves money on costly do-overs, and can save your back and arms extra strain. High quality brushes are less likely to lose bristles or leave brush marks on your floor. Look for a wide brush if you are planning on using it for most of the painting, and include a one or two inch brush for detail work and for cutting-in from the baseboard into the room. Using a roller for your floor painting project will help make the job go faster because you'll be getting good coverage with each stroke. Decide whether or not you'll be working with a long or short pole, and test the handle and length for comfort. Roller covers are rated for different surface finishes. Select a short nap roller cover, and avoid overloading it with paint as you work. This is the best way to achieve even coverage across the floor without drips or lines. There are a number of heavy coverage paints available now that will work well on a floor; these include especially designed floor, porch, and deck paint. You can also use oil-based enamel paint. If you need to prime your floor, there are self-priming paints available too. 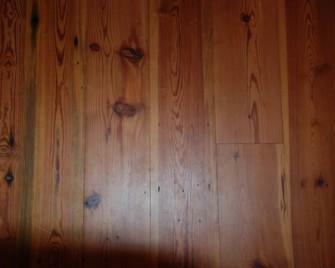 Painting wood floors is like painting any other flat surface. Use either a roller or a wide wall brush for the project. Avoid sprayers because they can often drip and over spray onto the walls. Start by cutting in from the baseboard a few inches. Go around the room completely, and then allow the paint to dry. Follow up by brushing or rolling in long, even strokes. Follow the grain of the wood. Overlap strokes from section to section as you paint. Once you have one layer completed, allow it to dry completely. One of the easiest mistakes to make is to rush the job. Read the label for the paint you've purchased and follow the instructions. Better, add a few hours to a day to the recommended curing time, particularly if you're painting on a very hot, humid day. After you have one to two layers of paint down and dried, add a layer of polyurethane protector. Two layers would be better for high traffic areas, or if you have pets. If you have more elaborate painting plans, incorporating borders and stenciling into your floor design, you should still follow these basic rules. Add decorative paint colors only after the previous layers of paint have dried thoroughly, use quality accent paints, and add a protective polyurethane coating to protect your paint's finish from scratching.